Inhalation of Bacillus anthracis spores can cause a rapidly progressing fatal infection. B. anthracis secretes three protein toxins: lethal factor (LF), edema factor (EF), and protective antigen (PA). EF and LF may circulate as free or PA-bound forms. 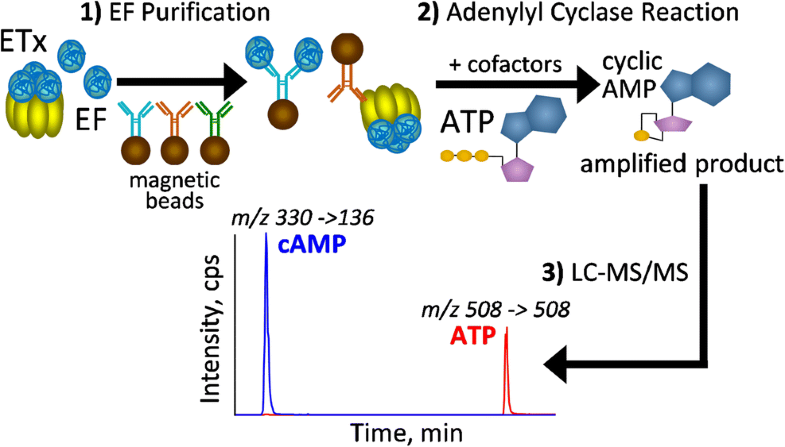 Both free EF (EF) and PA-bound-EF (ETx) have adenylyl cyclase activity converting ATP to cAMP. We developed an adenylyl cyclase activity-based method for detecting and quantifying total EF (EF+ETx) in plasma. The three-step method includes magnetic immunocapture with monoclonal antibodies, reaction with ATP generating cAMP, and quantification of cAMP by isotope-dilution HPLC-MS/MS. Total EF was quantified from 5PL regression of cAMP vs ETx concentration. The detection limit was 20 fg/mL (225 zeptomoles/mL for the 89 kDa protein). Relative standard deviations for controls with 0.3, 6.0, and 90 pg/mL were 11.7–16.6% with 91.2–99.5% accuracy. The method demonstrated 100% specificity in 238 human serum/plasma samples collected from unexposed healthy individuals, and 100% sensitivity in samples from 3 human and 5 rhesus macaques with inhalation anthrax. Analysis of EF in the rhesus macaques showed that it was detected earlier post-exposure than B. anthracis by culture and PCR. Similar to LF, the kinetics of EF over the course of infection were triphasic, with an initial rise (phase-1), decline (phase-2), and final rapid rise (phase-3). EF levels were ~ 2–4 orders of magnitude lower than LF during phase-1 and phase-2 and only ~ 6-fold lower at death/euthanasia. Analysis of EF improves early diagnosis and adds to our understanding of anthrax toxemia throughout infection. The LF/EF ratio may also indicate the stage of infection and need for advanced treatments. 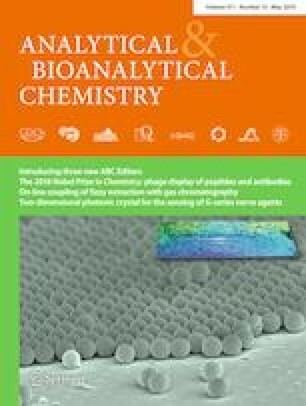 The online version of this article ( https://doi.org/10.1007/s00216-019-01730-4) contains supplementary material, which is available to authorized users. This work was supported in part by Health and Human Services (HHS) Agencies: Biomedical Advanced Research and Development Authority (BARDA), Centers for Disease Control and Prevention (CDC) - Office of Public Health Preparedness and Response (OPHPR) and the National Institutes of Health (NIH) - Intramural Research Program of the National Institute of Allergy and Infectious Diseases. The study protocol was performed in 2006 and was approved by Battelle and the CDC Institutional Animal Care and Use Committees (IACUC) (CDC IACUC protocol no. 1459BOYMONX and Battelle MREF protocol no. 570). The findings and conclusions in this report are those of the authors and do not necessarily represent the views of the Centers for Disease Control and Prevention. Use of trade names is for identification purposes only and does not imply endorsement by the Centers for Disease Control and Prevention, the Public Health Services, or the US Department of Health and Human Services.